There is a free film included with your admission. The theater is located in what was once the maintenance building and is now the exhibition space. The film runs about 20-25 minutes and is shown every half hour. Check the times to be able to view it in the language of your choice. Minimum age for the film is 14 (excluding babies) as there are, obviously, disturbing images of the camp victims. 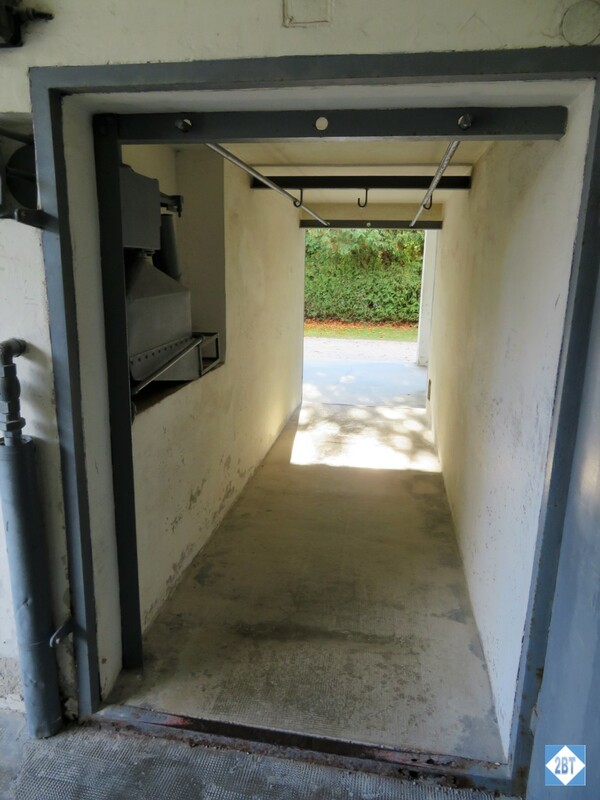 The Visitors Center is in a quiet, wooded area and there’s a gravel path between it and the camp’s entrance. It’s such a lovely setting that you have to keep reminding yourself that such loveliness can co-exist with the horror that lay just a few feet away. Before reaching the camp’s entrance you start to see things like this guard tower behind a wall to remind you of what you’ll soon be entering. And it’s here you read a marker indicating that this was the road down which some of the prisoners were marched into the camp. From here you can see what was once the commandant’s headquarters. And what was once the bakery and a storage building. Part of me thinks these buildings should be torn down as they were part of something so detestable. And the practical side of me realizes a building is just a shell and humans make it good or evil by its usage. 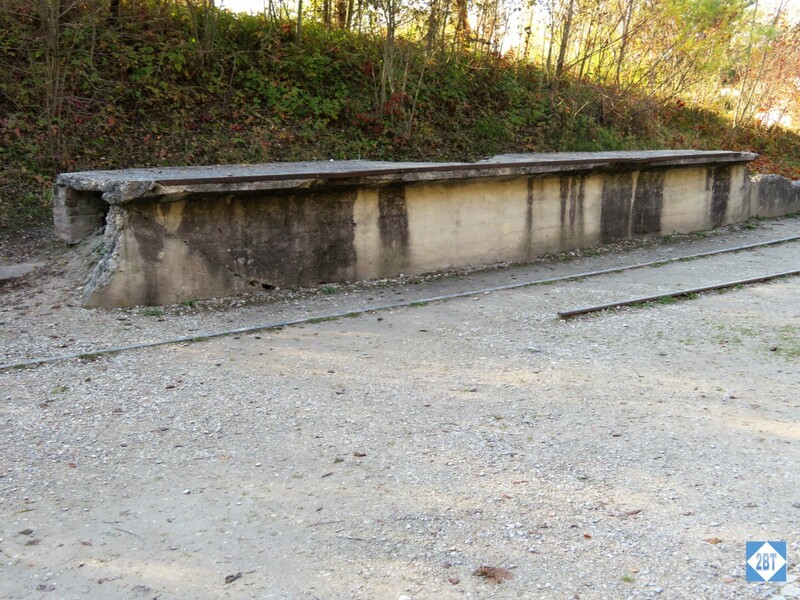 This was the end of the railroad spur where, during the war, prisoners were brought practically to the front gate. End of the line. Literally. And here is that gatehouse. 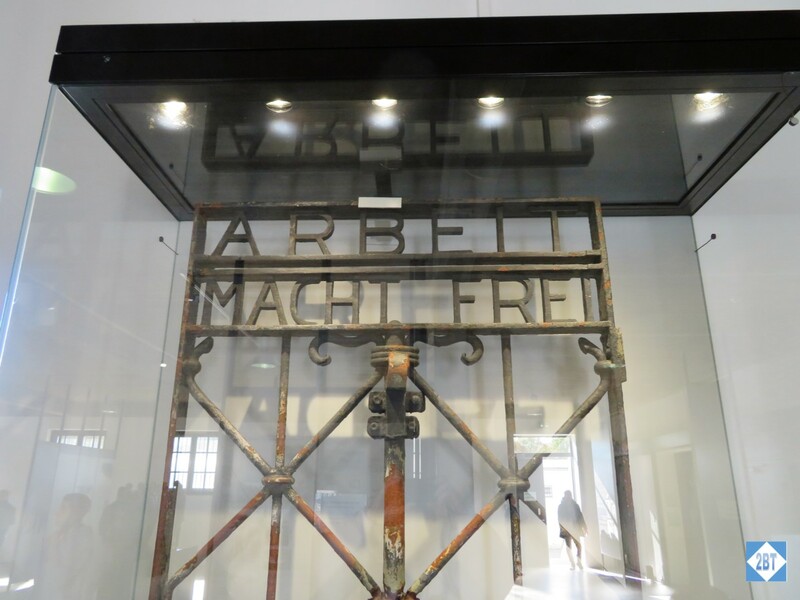 With the infamous quote built into the gate “Arbeit Macht Frei” or “Works Makes Free”. This is not the original gate; it is on display inside the permanent display. Through the gate you can see the large gravel area used for roll-call. From here the camp stretches in both directions, but much farther to the left. On the right is the U-shaped building used as a maintenance building during the war. 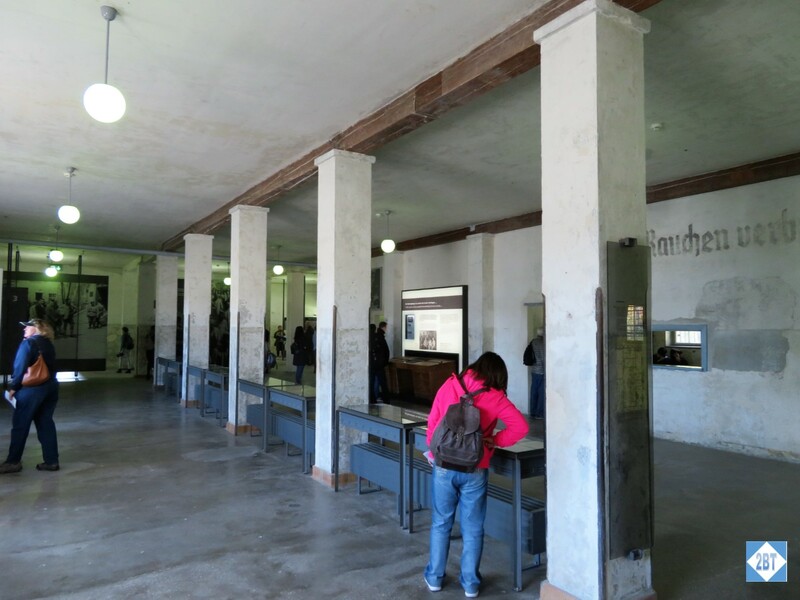 This was where prisoners were checked in, it held administrative offices and cells for special prisoners. The permanent exhibition is in the wing closest to the entrance, the movie theater is in the center of the U and the far wing is a rotating exhibit. There is an overwhelming amount of information in the exhibits but with few exceptions they are mostly large displays with text and photos. I will not cover any of that in this post but will cover a few other displays. 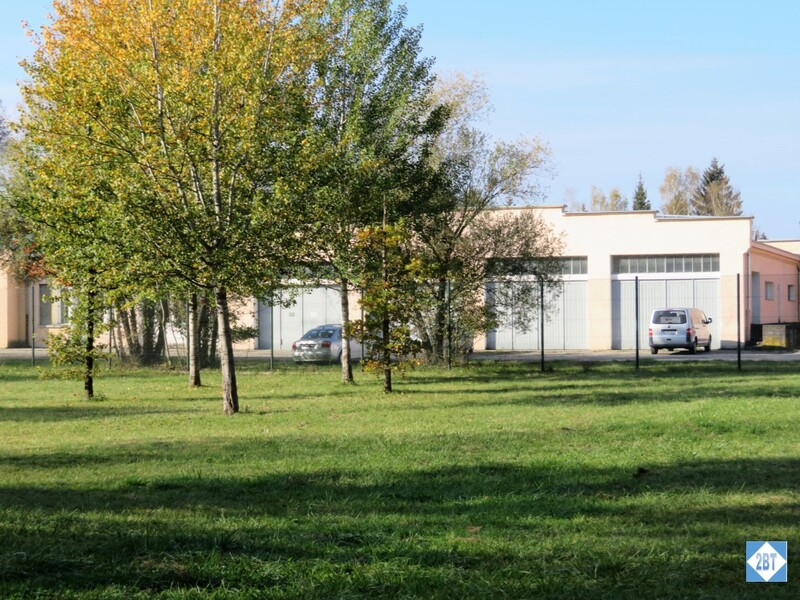 Outside, between the two wings of the maintenance building are several large exhibits and art installations. On the left are a couple of reconstructed barracks with displays of what the living conditions were like as time progressed. Behind those buildings were the concrete bases of the remaining barracks. When the site was made a memorial in the mid-1960s, these buildings were in terrible condition and were torn down. 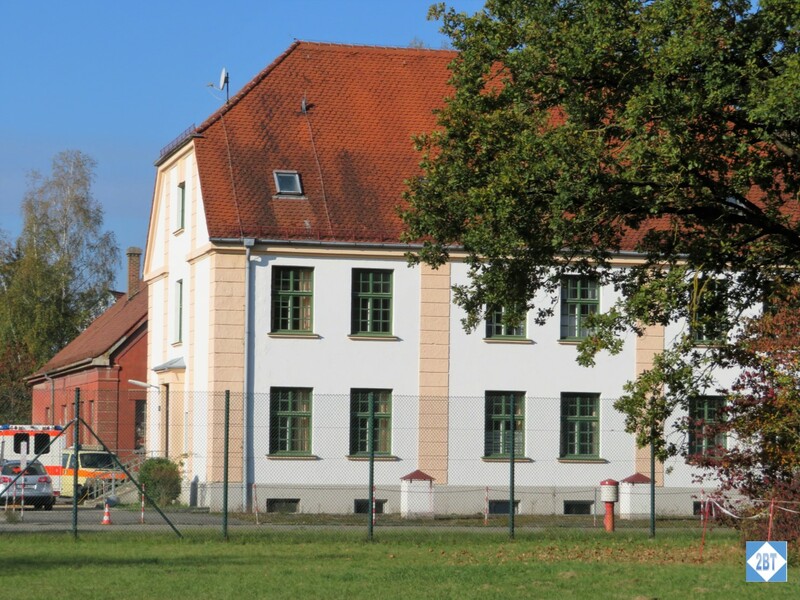 Reconstructed Barracks. Inside there were several versions of what the interior looked like over the various years the camp was open. At the very far left upon entering, against the back wall are three chapels: one Protestant, one Catholic and one Jewish. Just outside the wall behind these memorials is a Catholic Nunnery that was in place even during the war. 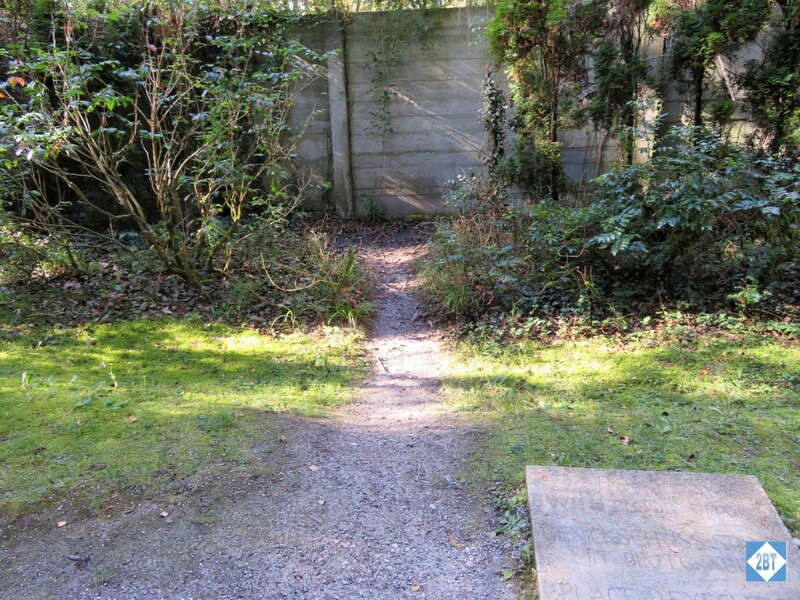 The concrete outlines stretch almost all the way to the back fence. In the distance are three memorial chapels. 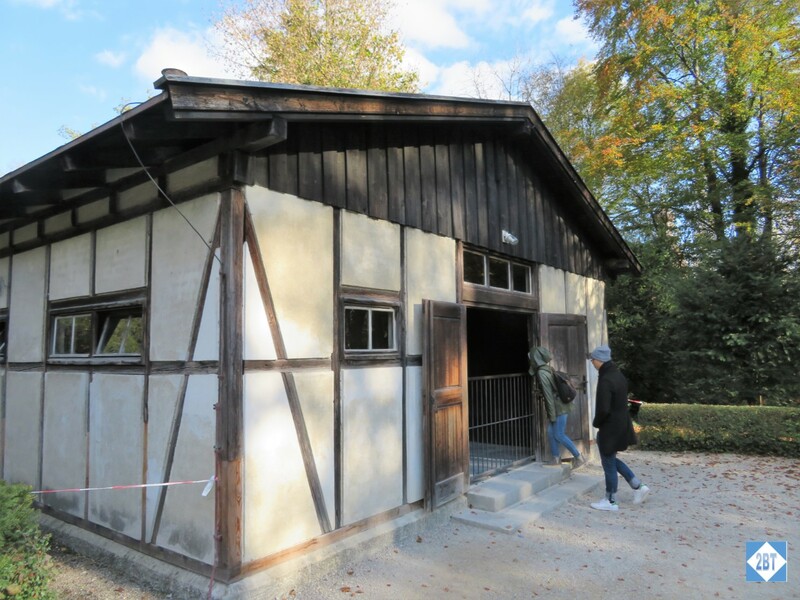 In the left corner, on the same side as the main entrance, is the path to the crematorium area and the Russian Orthodox chapel. Guard towers like these appear at each corner and at various points along each wall. The fencing was somewhat crude, but very effective. Fences on some sides were solid, with a 10-foot zone in front of them established as a neutral zone. Guards were known to toss prisoners’ caps into that area just for fun, with prisoners knowing they’d be shot if they tried to retrieve them. And some prisoners deliberately went into that area to end their own suffering. 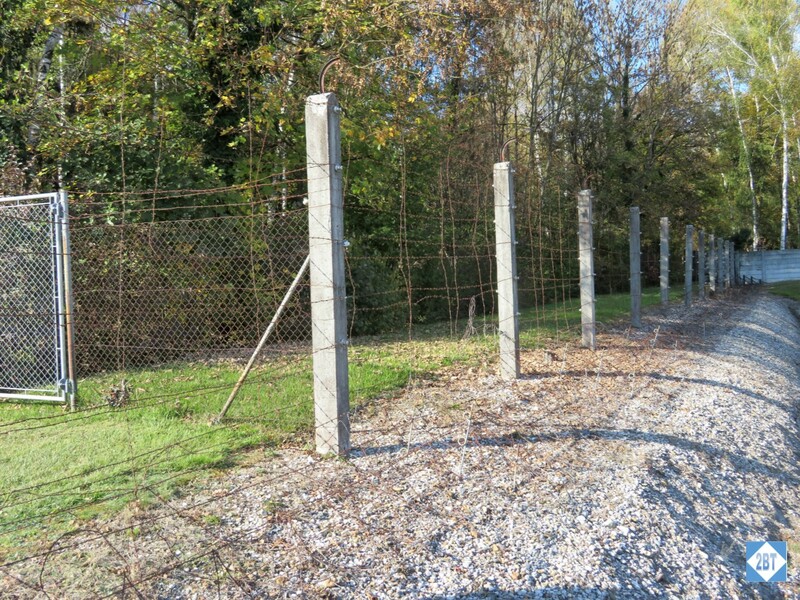 On the west side of the camp, along the river Amper, this electrified barbed wire fence was the barrier. This building contains most of the exhibits with photos and numerous stops on the audio tour. 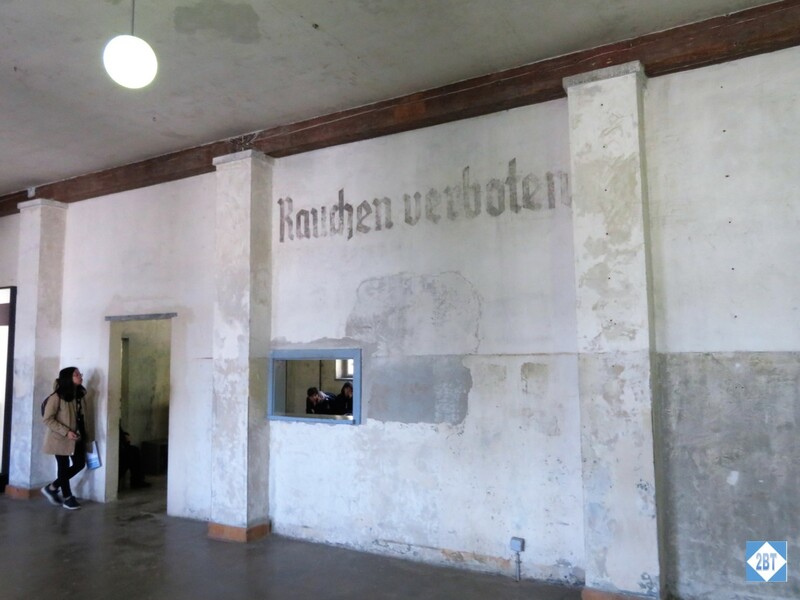 This hall was where prisoners were processed upon arrival. They were registered, given a lecture from the custody camp leader and brought to this room where they had to hand over clothing and anything else they had brought with them. 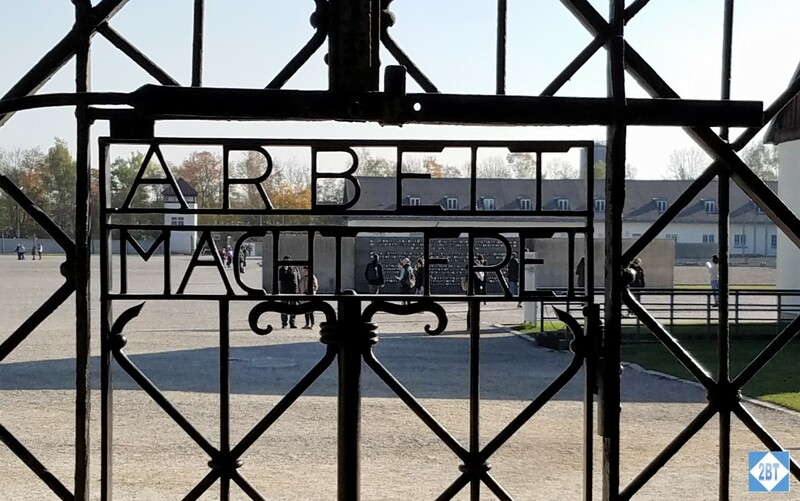 The very thought that smoking was prohibited (“kauchen verboten”) yet the existence of the concentration camp is OK is a concept that is very difficult to comprehend. 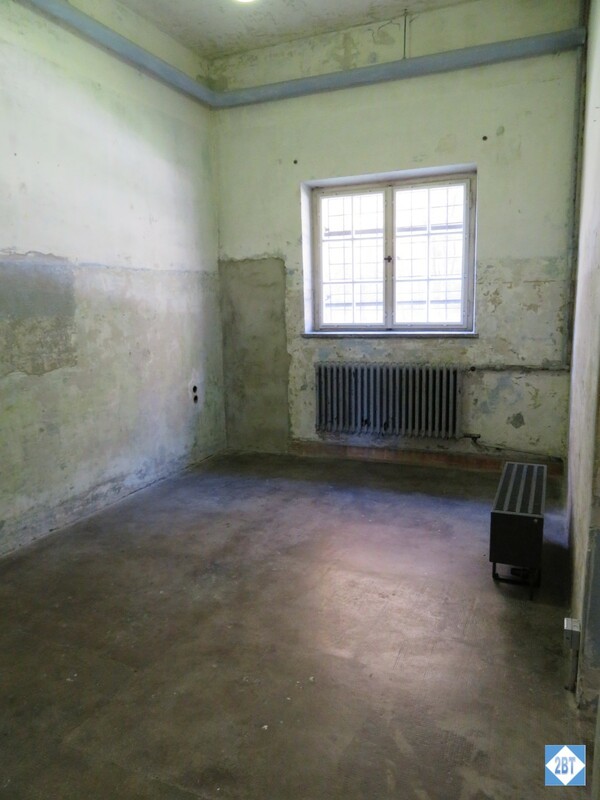 This was a cell where a “special” prisoner might be held. One of those special prisoners was Johann Georg Elser who had tried to assassinate Hitler in 1939. These cells were larger than some of the others. The original gate of the camp. This is what is known as a “standing cell” or rather this is what would be sub-divided into a standing cell. 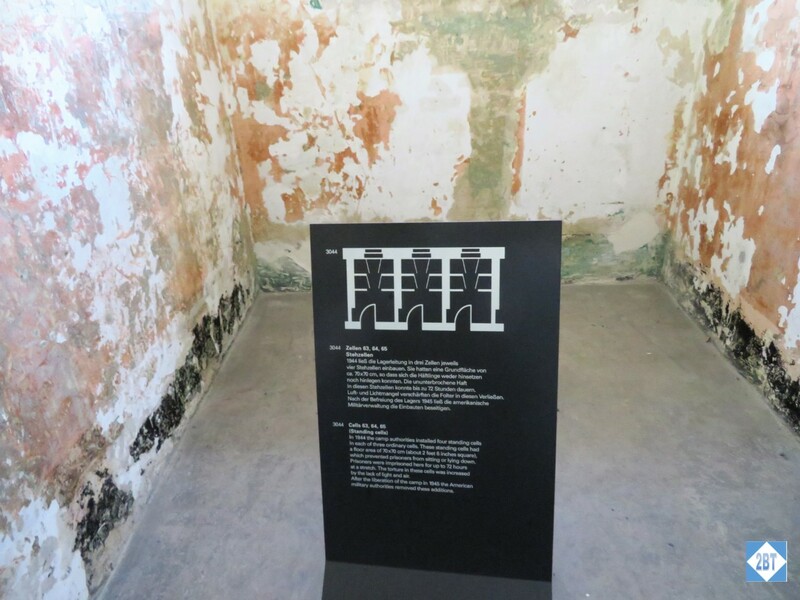 As illustrated, the cell was partitioned into areas that were about 2.5 feet square, so small that a person couldn’t even sit down but would be forced to stand. And they would leave the prisoners here for up to 72 hours at a time. When the camp was liberated, the American forces removed the partitions. 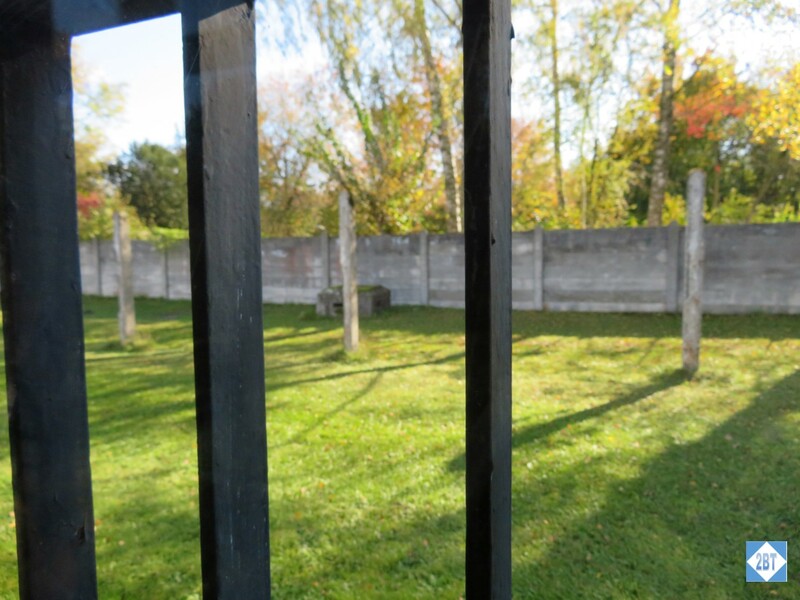 Out the back window of the maintenance building we could see the posts where prisoners would be chained and stripped during the icy weather as a form of medical experimentation. Nearly 100 prisoners died of medical experimentation though the records were destroyed in the last days as officials sought to cover up the atrocities. 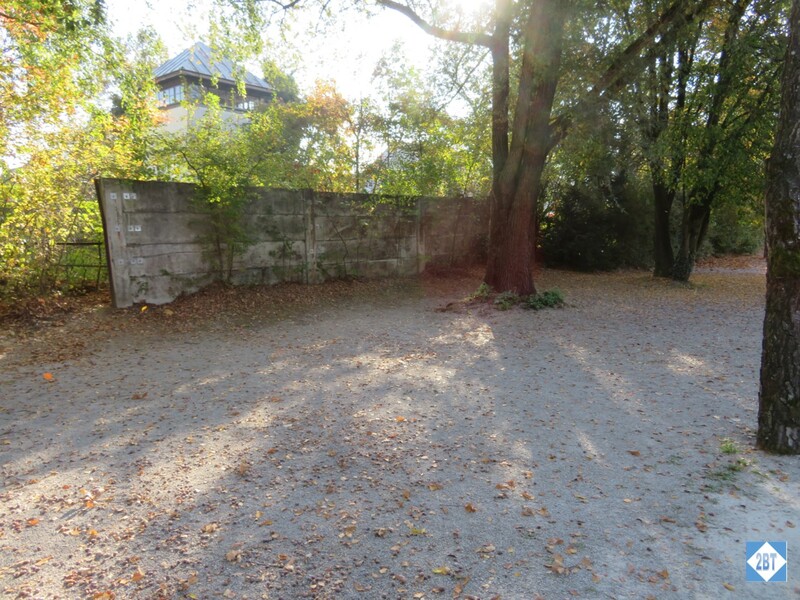 The yard behind the maintenance building, just one place medical experiments were conducted. Outdoors, in the center of the U-shaped maintenance building are several memorials. Each prisoner at the camp wore a patch of one color or another depending on what type of prisoner they were. The “officially recognized” persecuted groups in 1945 were those persecuted for political, racial or religious reasons. 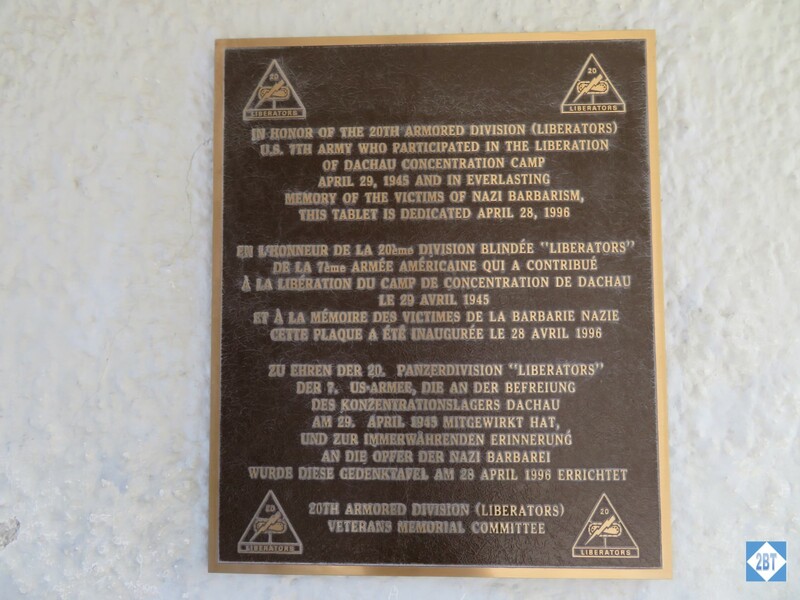 Yet the camp contained prisoners with different-colored badges who were persecuted because they were “asocial”, homosexual or “criminal prisoners”. 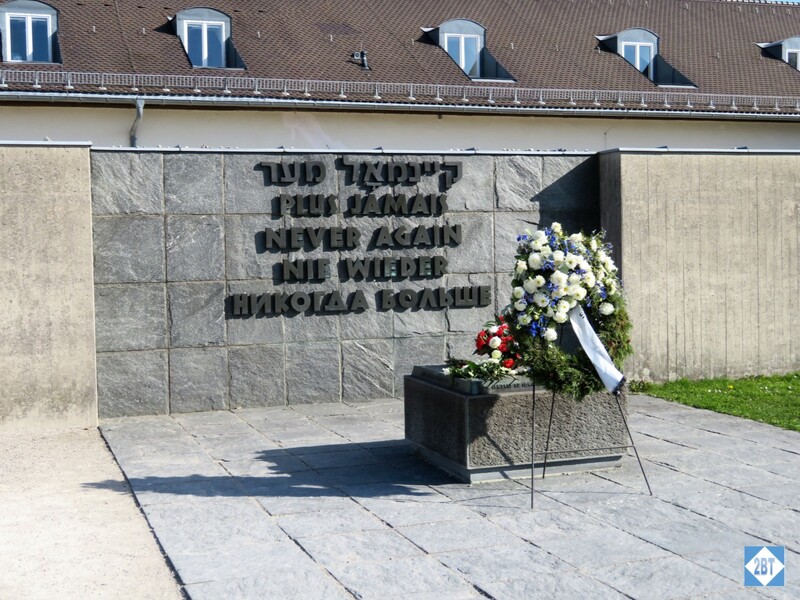 Per the Dachau website those groups are the so-called “forgotten victims” and have only been a topic of research since the 1980s. 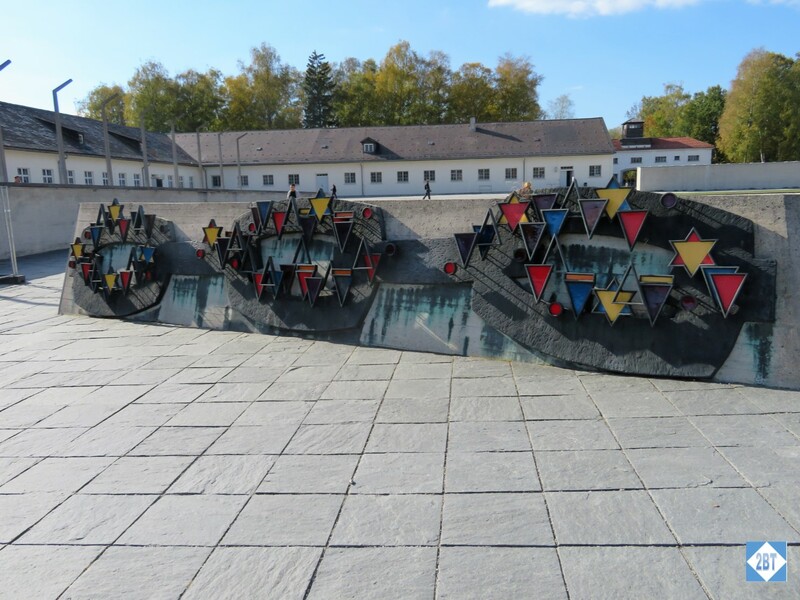 This relief uses the badges representing the “officially recognized” prisoners. 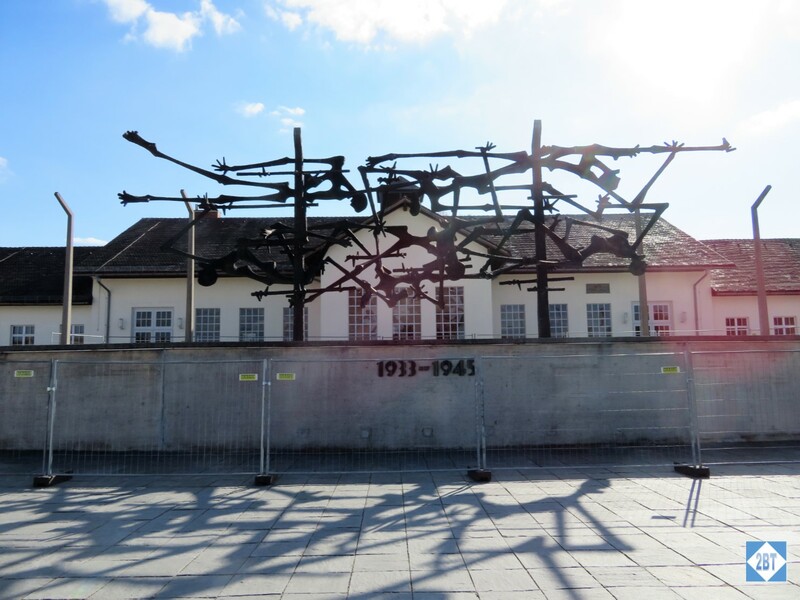 This memorial depicts human skeletons on the barbed wire fences that surround the complex along with the dates of its operation. 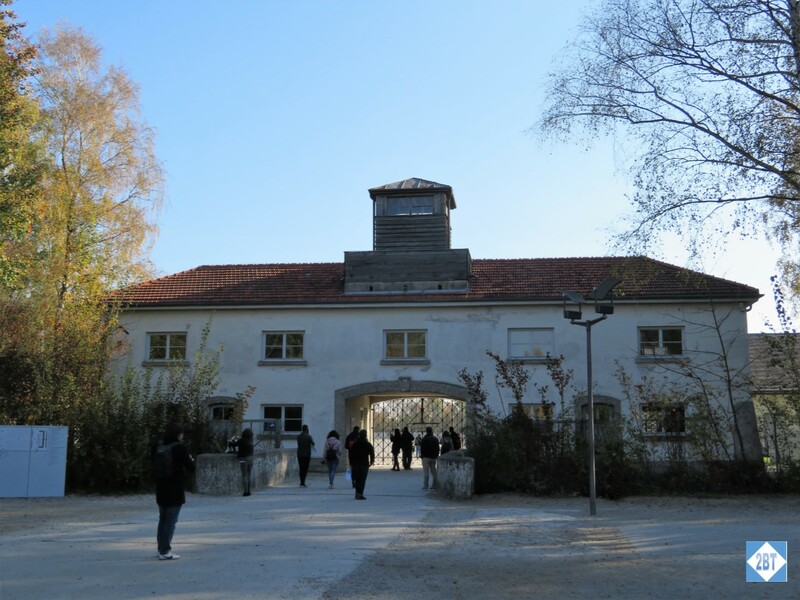 Dachau was the first concentration camp to open and lasted for the entire reign of the Nazi party. 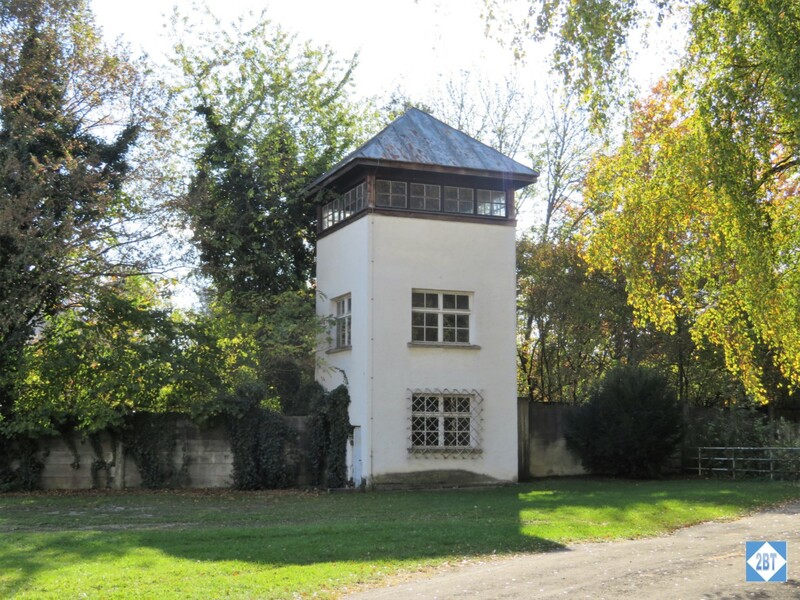 Before the war broke out, the camp was opened to house prisoners moved here from other prisons, Jehovah’s Witnesses, homosexuals, immigrants, German and Austrian Jews, Sinti and Roma as well as over 13,000 Polish prisoners. 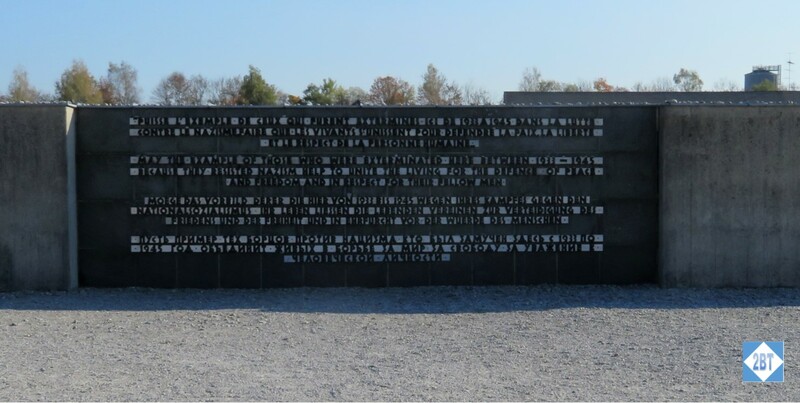 The other part of this memorial is this inscription in several languages: May the example of those who were exterminated here between 1933 and 1945 because of their fight against National Socialism unite the living in their defense of peace and freedom and in reverence of human dignity. 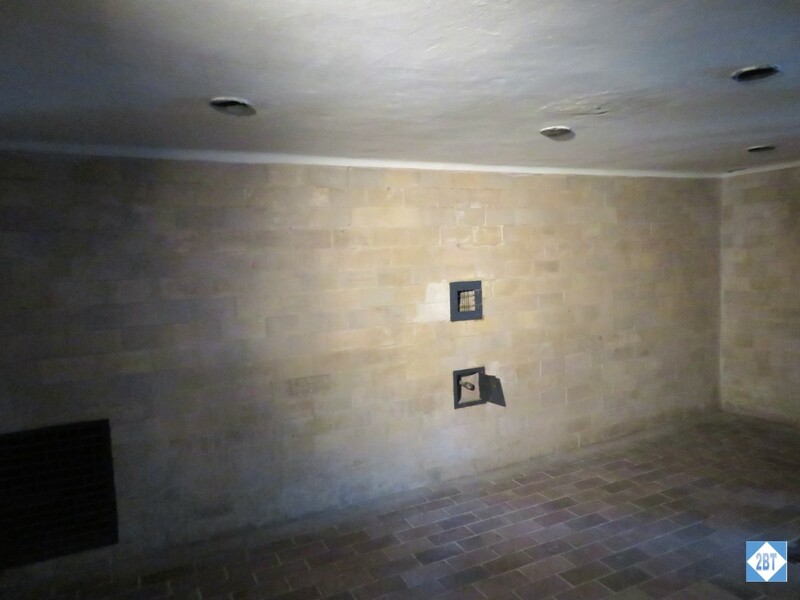 The concrete box in front of this wall contains the ashes of an unknown prisoner. The wall contains the words “Never Again” in Hebrew, French, English, German and Russian. Perhaps strangely there’s a pretty path leading from the large section of the camp out to the crematorium. My assumption is that the smell was bad enough that even the guards did not want to be close to it. 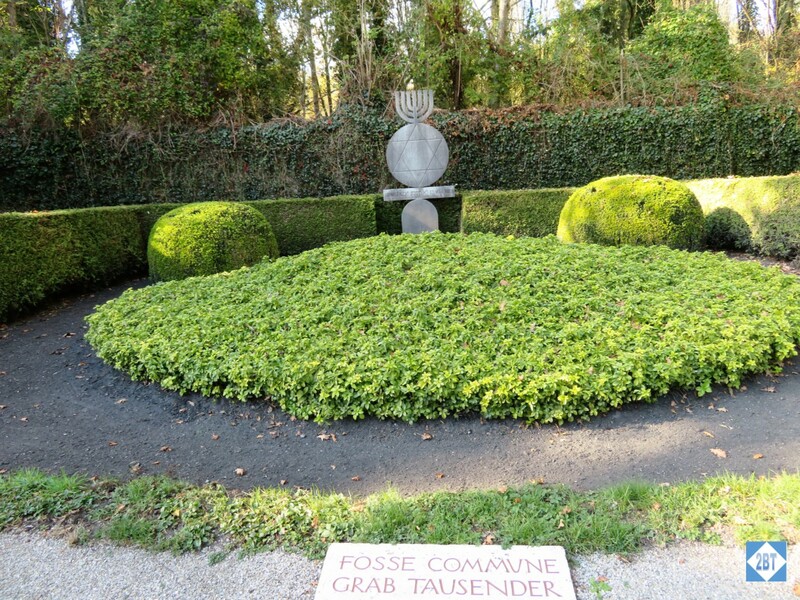 Before reaching the crematorium buildings you can take a detour down a sobering path with several different memorials. 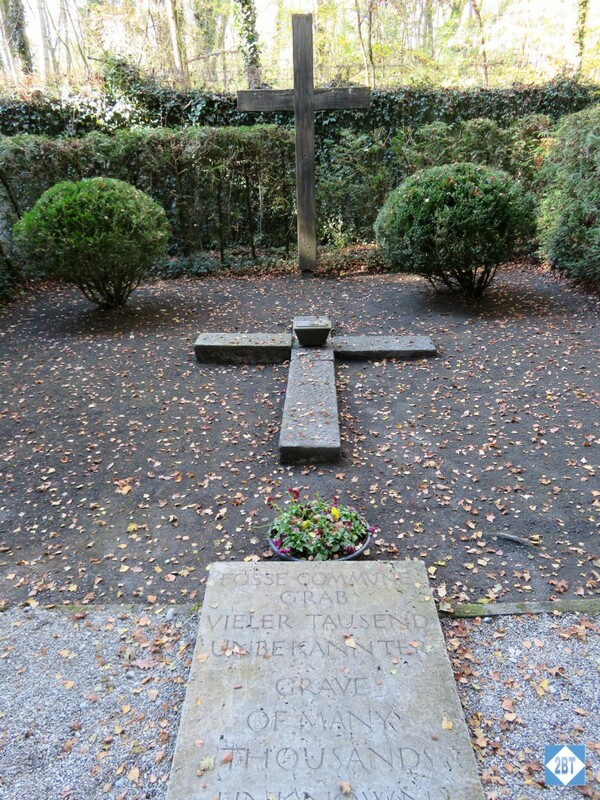 This Christian one represents the Grave of Many Thousand Unknown. The marker stone here denotes that executions were performed here and the trench ran with blood. Here is the Jewish Grave of Thousands of Unknown. 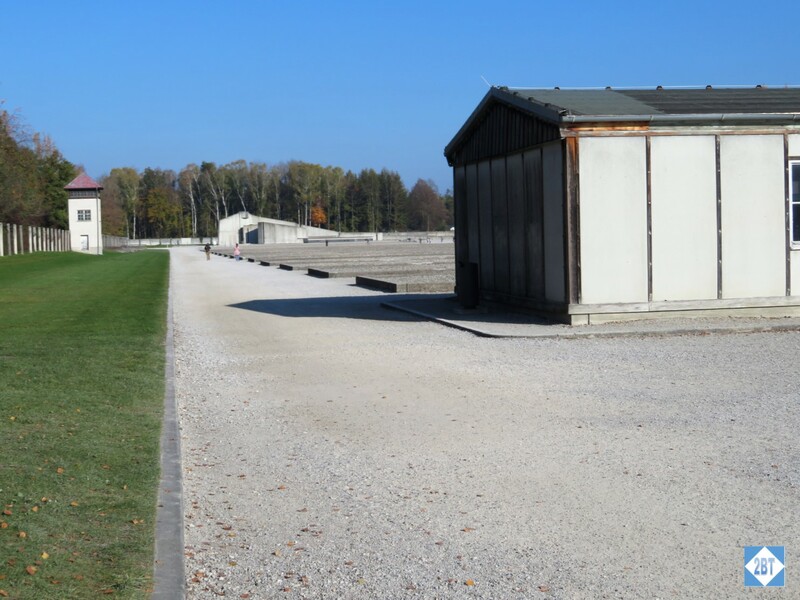 There are actually two buildings that served as a crematorium for Dachau. This first one was built in 1940 once the foreign prisoners arrived and the mortality rate started increasing. A year later the need for it exceeded its capacity. Approximately 11,000 prisoners were cremated here until it closed in April 1943. Inside the new crematorium corpses were brought to this room and stacked until they could be cremated. 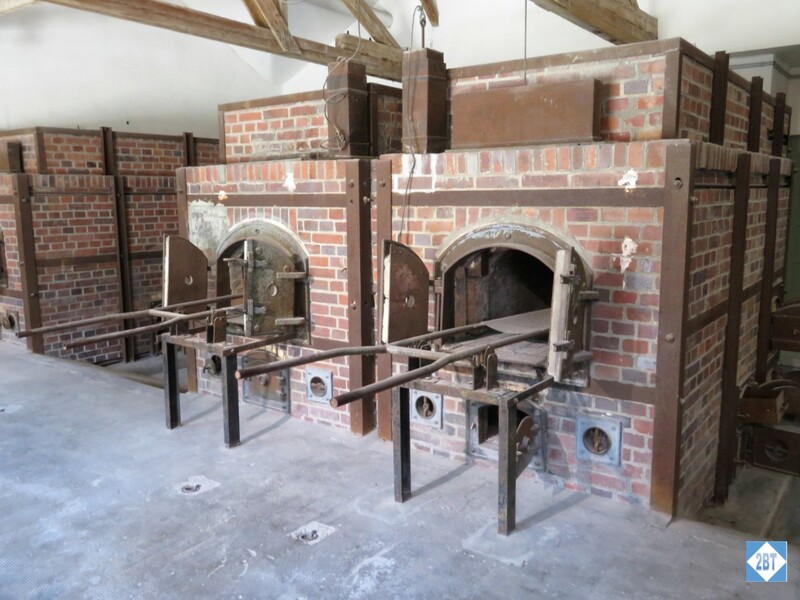 Here there were several more ovens and the slabs were long enough to cremate two bodies at a time. 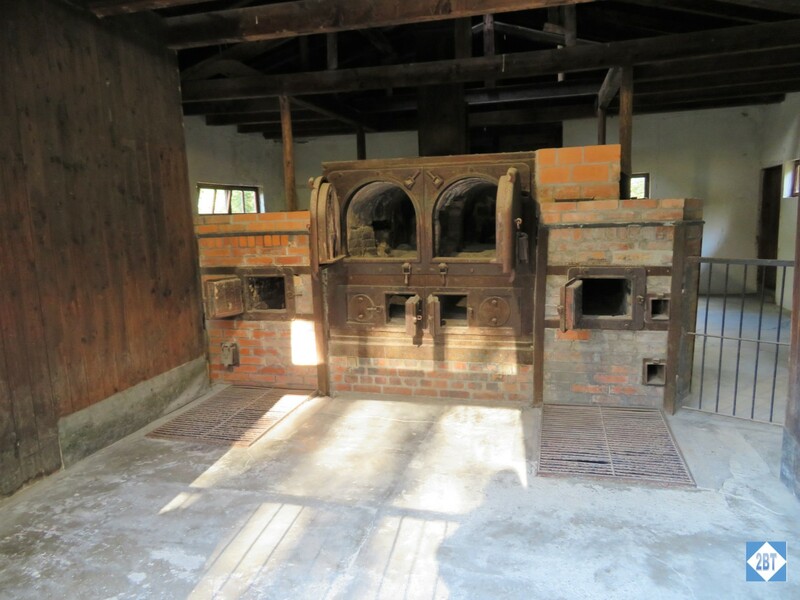 Still, by 1944, the ovens’ capacity had been exceeded. 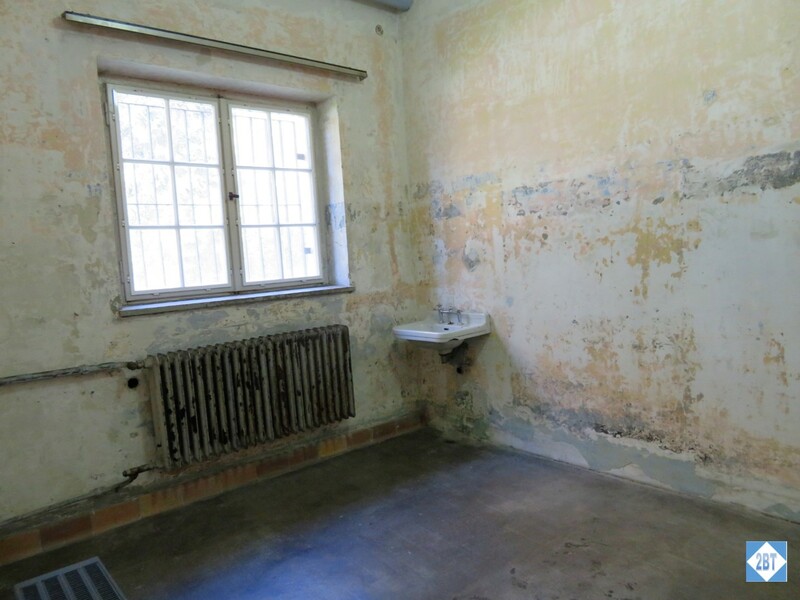 This is one of the “shower” rooms like the ones made infamous at Auschwitz. 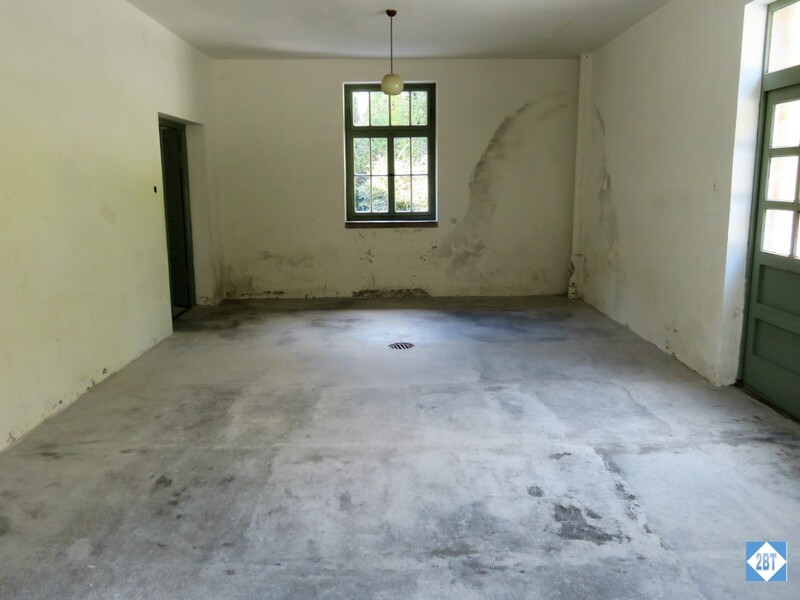 Unlike those rooms where prisoners died of inhaling poisonous gases, these rooms were not really used at Dachau. Due to the unhealthy hygienic conditions, both upon arriving and within the camp, the clothing of the dead had to be disinfected. The clothing would be sealed in this chamber and prussic acid poison gas was used to disinfect them. A ventilator in the attic above was used to clear the air afterwards. 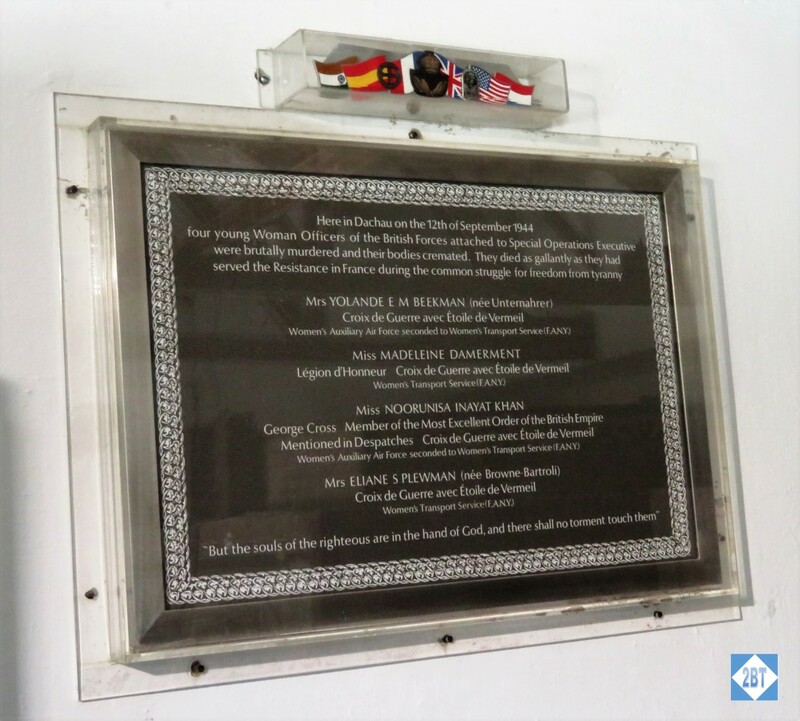 As we left the crematorium I saw this plaque dedicated to four women of the British forces who were murdered in the camp and whose bodies were cremated. I had never heard their stories before and they are fascinating. The women were all captured in nearby occupied portions of France as they worked for the Special Operations Executive branch of the British military. Khan’s story will be told in the 2019 film “Liberté: A Call to Spy”. 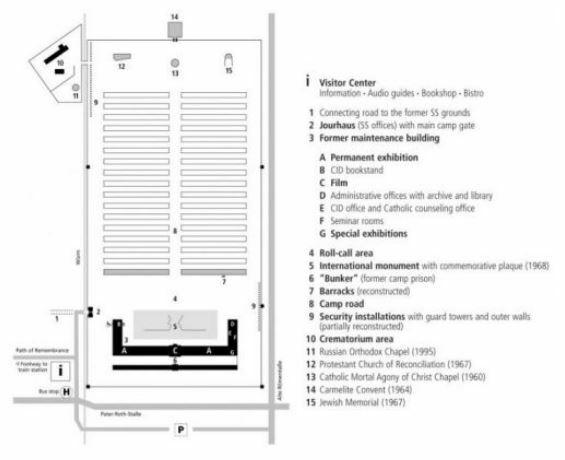 Over 2700 priests (2579 Catholic) were held in the camp as was a Nobel Prize winner. Ten members of German royalty were imprisoned though all survived. Two of those members, Franz, Duke of Bavaria and Prince Max, Duke in Bavaria, are still living. 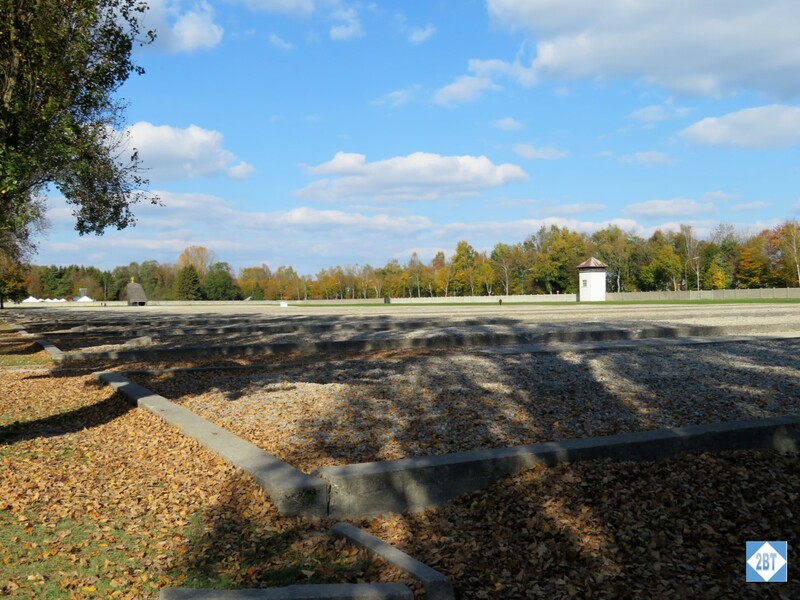 As the Allied forces moved to liberate several of the camps, thousands of prisoners were executed or sent on death marches before they could arrive. 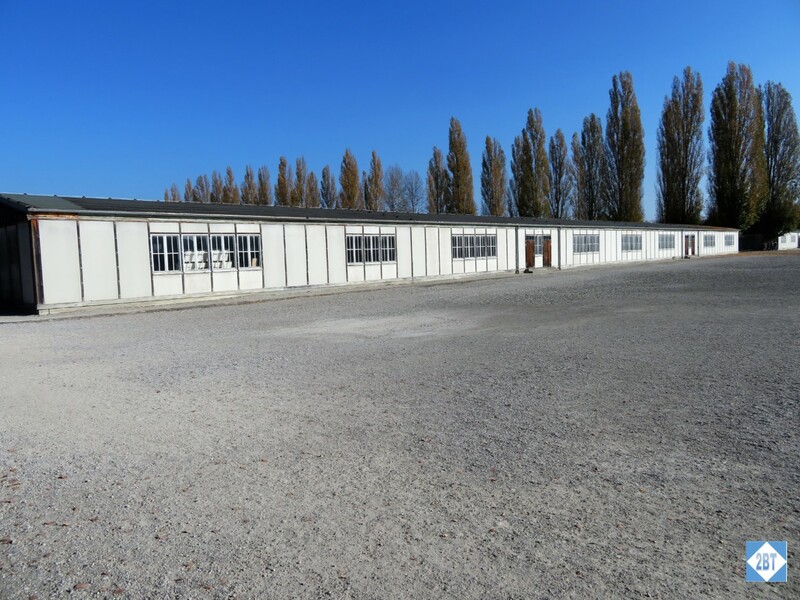 The camp was officially turned over to US forces on 29 April 1945. This was a very well thought-out, well executed memorial. Including travel time from Munich I would plan on at least 5-6 hours for this visit if you care anything about reading the information in the exhibits. This is not a place for young children or even pre-teens as there are no special exhibits for them and they may find some of the photos upsetting. I’m glad we decided to visit and I am grateful for the German government and the camp survivors who worked to make this memorial possible.